I love the title of Chapter 7, "Connecting the Dots" because it is a great way to think about inferring, which is difficult for word callers. Kelly Cartwright categorizes inferences into two types: text-connecting and gap-filling. Text-connecting inferences require a reader to connect two ideas from a text to construct an idea that is not explicitly stated in the text. Gap-filling inferences require a reader to connect their background knowledge to a piece (or multiple pieces) of text information to construct meaning. 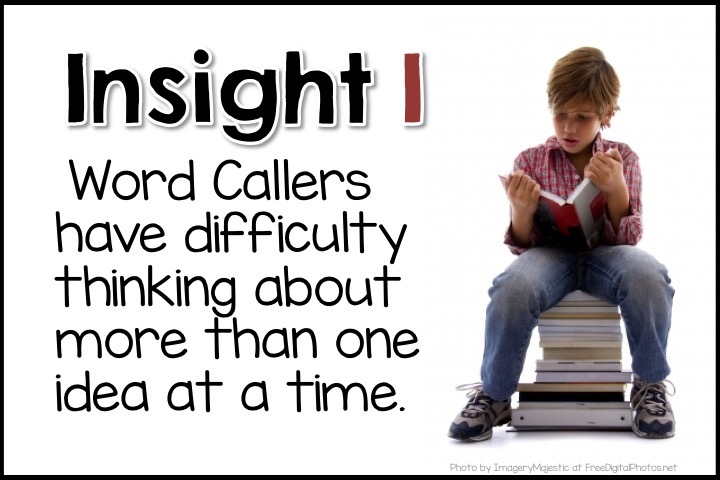 Word callers have trouble with inference because they have to connect MULTIPLE bits of information and talk/think about things that are not in the text. What can we do to help them? We need to "make students aware that there are hidden meanings in the text that must be discovered. (Cartwright, 2010, p. 98). Working with students on an individual basis allows the teacher to provide more specific, feedback to that student. 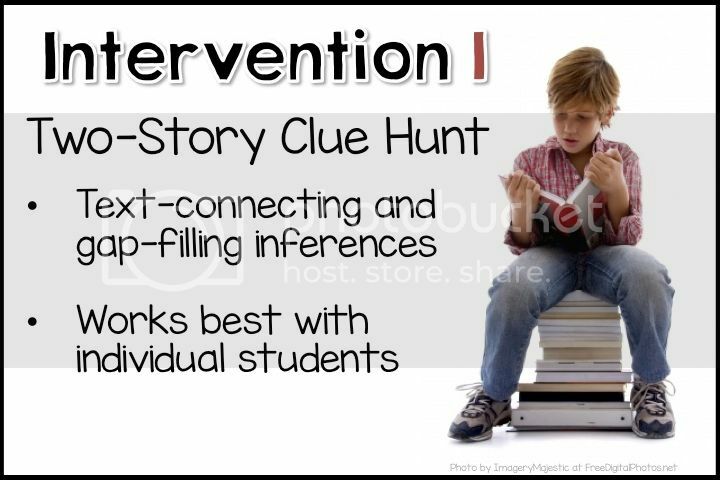 Using the two-story clue hunt, helps students make text-connecting and gap-filling inferences by using clue words in the story to create those inferences. Explain to students that you will be solving a puzzle today as they read a story. To solve the puzzle we are going to look for clue words. Read the first story. Identify the clue words and explain what the clue words reveal about the story. Read the second story. The student helps you identify the clue words and explains what they tell about the story. For any clue words that the student doesn't identify, tell the clue words and work WITH them to develop an explanation. 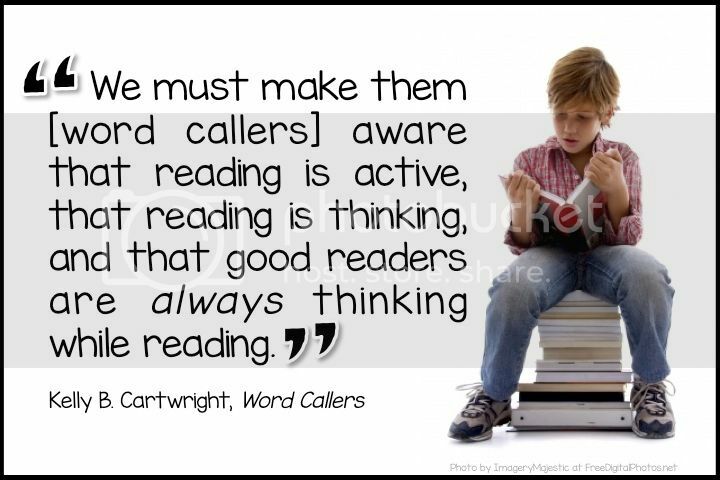 Because word callers don't recognize reading as a meaning-making process, they need to be nudged in the right direction. Three-step inference building is an intensive process that spans six to seven small-group lessons that result in students becoming active thinkers. Finding Clue Words (lessons 1, 2, & 3) - Students find clue words in sentences and discuss the meanings provided by the clue words. Question Generating (lessons 4, 5, & 6) - Students become the teacher and ask questions using the clue words that will help their fellow students make inferences. Making Predictions (lesson 7) - Use a story that has one sentence covered. Have students use clues from the rest of the story to determine the meaning of the sentence covered. Without explicit instruction in how to comprehend texts, we cannot expect word callers to become active readers. 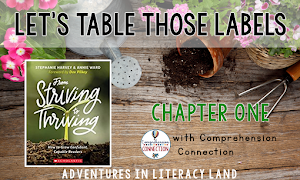 We need to give these students a glimpse into the mind of a proficient reader by "actively engag[ing] students in a running conversation about texts' meanings and their own thoughts about those meaning while reading a text. (Cartwright, 2010, p. 113). We can do these through a process called Transactional Strategies Instruction where strategies are blended into a meaning-making experience rather than taught and practiced in isolation. Gather a small group (this a conversational type strategy) and pick a common text to read. Gradual Release of Responsibility - Provide a specific strategy for students to use. Before asking them to use it, explain the reasoning behind using the strategy - How does it help a reader make meaning? Collaborative Learning - This is a student-centered approach because the teacher releases responsibility to the students quickly. Asking questions like "What makes you think that?" and having students explain their thinking to each other. Interpretative Discussion - Teachers guide students' thinking by prompting them with strategy use questions instead of giving evaluative feedback. Students contributions are valued and supported. "TSI is about changing the way you teach, not just changing what you teach. (Cartwright, 2010, p. 114). Consider the difference between text-connecting and gap-filling inferences. Have you noticed that your students find one ore the other more difficult? Why do you think this is the cause? How is TSI similar to your current comprehension instruction? How is it different? Welcome to Chapter Four~ Easy Intervention Lessons: Word and Picture Sorts! 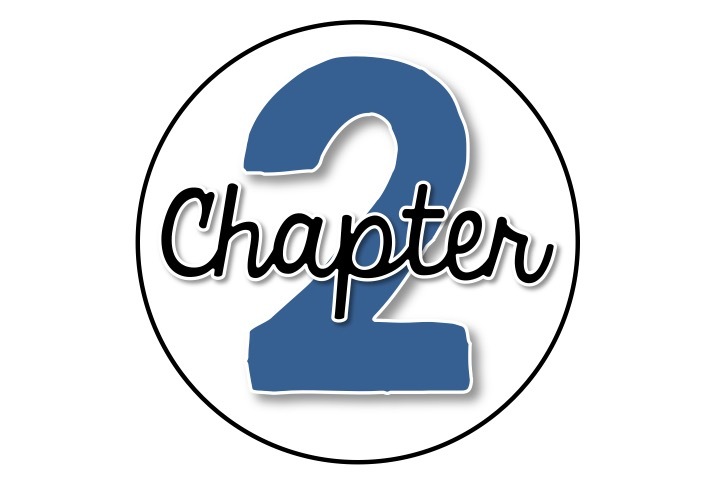 It's Lauren from Teacher Mom of 3 here with you today to share the highlights and my reflections from this chapter. If you missed Andrea's post from yesterday about identifying word callers, click here. First, I want to share why I was so intrigued by this book. Since the beginning of my career, some 26 years ago, I have been both baffled and curious as to how to teach and offer intervention for comprehension. Not "getting it" is very common in older readers, even the "good" readers I have taught in grades 3-12. Being a high school and then later a middle school teacher years ago, I studied researchers such as Stephanie Harvey, Jeffrey Wilhelm, Ellin Keene, Donald Graves, and more. I was thrilled to see that Cartwright also makes mention of these renowned researchers at the end of the book. As a result, my teaching style includes modeling and explicit teaching of active reading strategies for all grade levels. However, I have never seen a specific assessment and targeted intervention for these readers who struggle with making and thinking flexibly meaning until I read this book. Thus, in order to help these children become successful comprehenders, we must make them aware that reading is active, that reading is thinking, and that good readers are always thinking while reading. 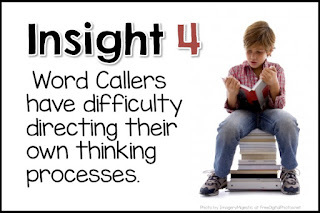 Word callers have great difficulty with active thinking. That is, they are "glued" to the print and decoding and are unable to also think about meaning simultaneously. 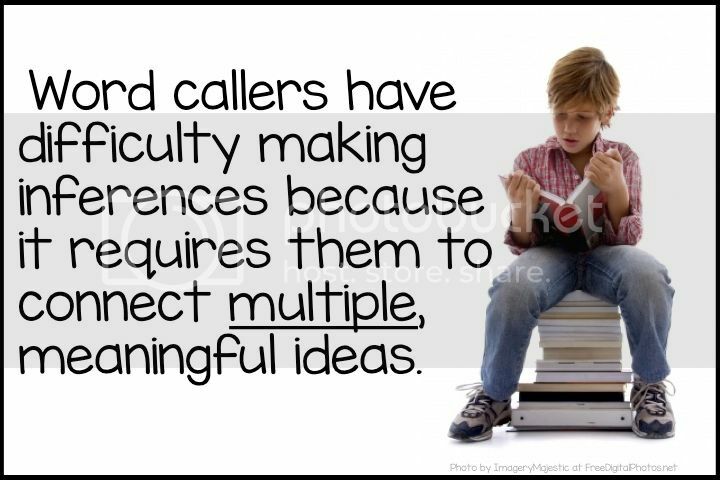 We all have taught and worked with word callers. And, I'm pretty sure we will have students on our roster this school year who can read very fluently, but do not understand their reading. They have great difficulty with retellings, summarizing, and answering literal level questions as well as implicit questions. They can read the words but they just don't get it. 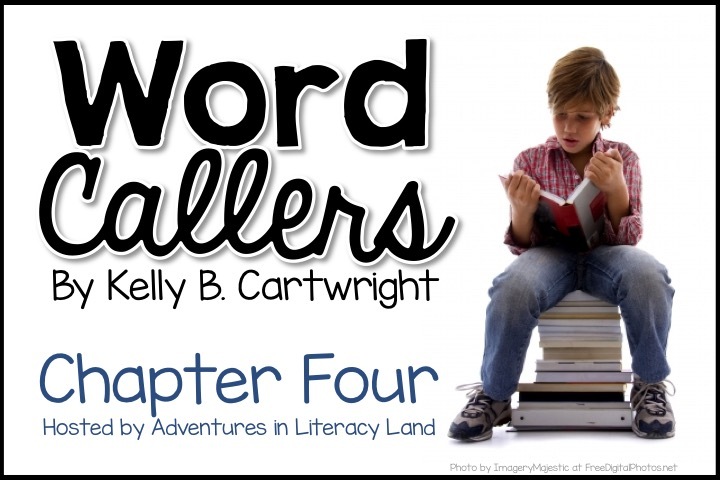 They are word callers because as Cartwright mentions in chapter 4, they have great difficulty thinking flexibly about both sounds and meanings when reading words. In fact, I have a word caller at home, and I was eager to learn new ideas to help him make meaning during and after reading. It is mainly because of my son that I wanted to read and participate in this book study! The Sound-Meaning Flexibility Intervention is the intervention that was created by Kelly Cartwright and is explained in detailed in chapter four. As a side note, the rest of the book discusses other intervention/teaching methods for strengthening comprehension. This book is unique in that not only does it describe in depth a new assessment tool and an intervention method, but the materials to use for both accompany the book! I first assessed my son using the word cards that are included and followed the directions in chapter three (this is what Andrea discussed yesterday). As I suspected, he scored below average for this age/grade level. Because he has difficulty remembering what he reads, completing a retelling, and answering literal level questions, I had a clue that he was a word caller. Now for the intervention lessons. The Sound-Meaning Flexibility Intervention can be delivered both individually and in small groups. Very detailed instructions are included for both as well as photos, diagrams, and a scoring sheet. Since I was working with just one child, my son, I will share with you the information I found to be important and relevant when administering this intervention. The author claims that improved comprehension can be measured in just five lessons (one lesson per week for 5 weeks). 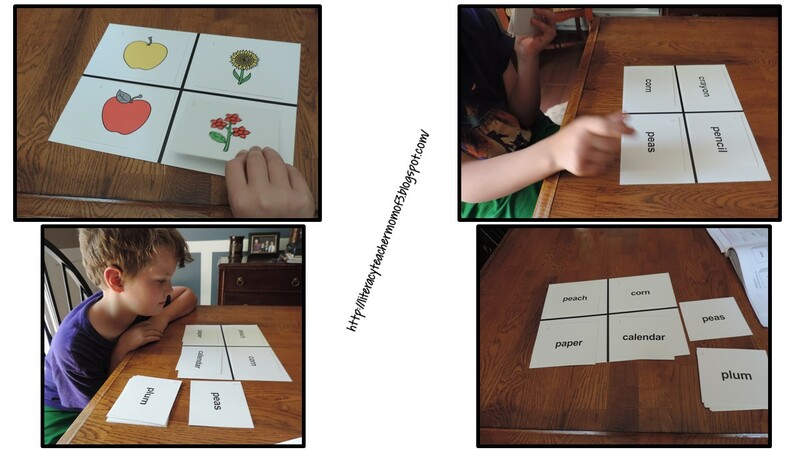 Each intervention lesson has two main parts: picture work and word work. It is suggested that you begin with the picture sort and use as a scaffold. When the student does not need it anymore, then your lessons will just focus on the word cards. By lesson #3, I was able to omit the picture cards. At the beginning, we discuss what flexible, good readers think about and then move into sorting the picture cards. 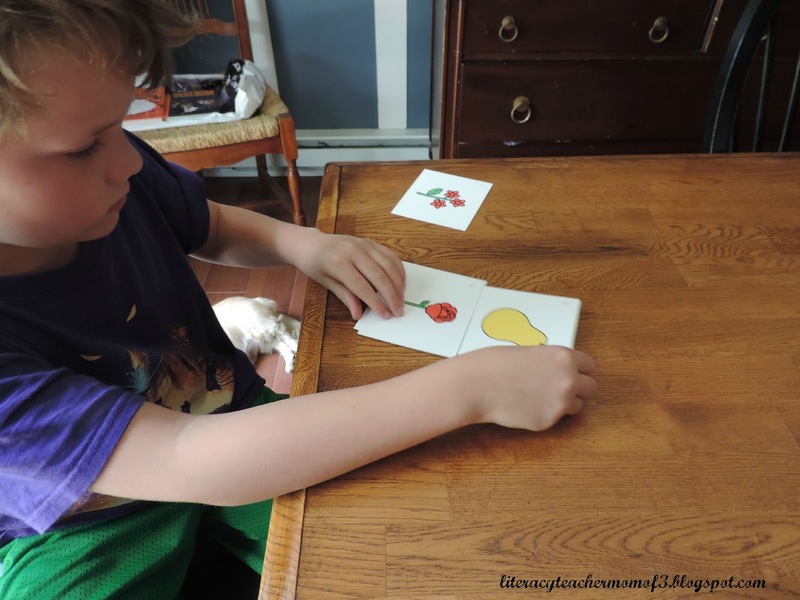 In the photo below he is sorting by one dimension (what the pictures mean: fruit and flowers). He repeated a second sort where he just sorted by color. Then he used the matrix that is included to sort by both dimensions. See the top, left picture. Next, using the intervention lesson directions, he completed four word sorts. For each sort, he had to place the word cards on the matrix sorting by two dimensions, sound and word meaning. See the bottom, right picture of a completed word sort. You can see that he sorted by sound (columns) and word meanings (rows). This was hard for him to make the transition from the pictures to the words. That is how I knew that he would need to use the picture cards for the next lesson. For the (4) word sorts, the student must get (4) consecutive sorts correct. Once you and the student get the hang of it, the intervention lesson can be completed in about 20 minutes. The author mentions that if you are delivering the intervention to small groups to allow for up to 40 minutes at the beginning. There are some flexible options that the author discusses in the chapter. Now, we still need to do two more lessons, and then I am excited to see how well he uses his flexible thinking with his chapter book reading! Have you used this particular intervention? Or, have you used other interventions or lessons for teaching readers to think flexibly about words, sounds, and meaning? 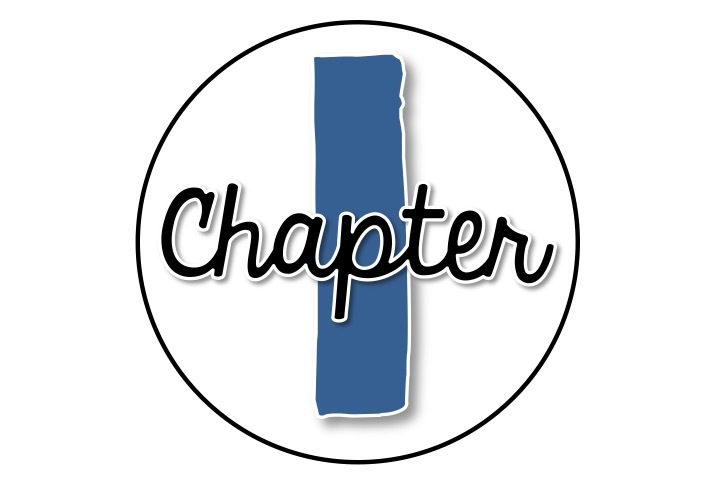 Be sure to come back tomorrow for a recap of chapters 5 and 6! Welcome Literacy Land Readers! I'm so excited to kick off our Word Callers book study with you. Thanks for joining us as we learn how to identify the word callers in our classrooms and help them flex their thinking. Word callers. We've all had them in our classrooms. 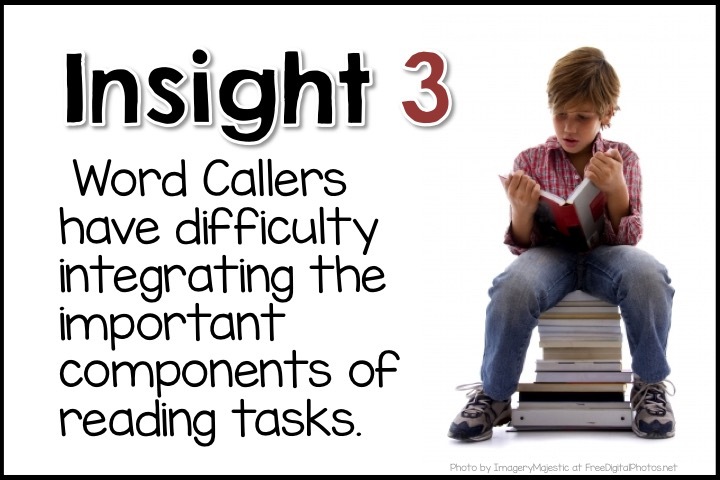 In fact, up to a third of our struggling readers are word callers. They are students who can identify and decode words but have difficulty processing their meaning. I bet you can picture one of these students in your head. Word callers struggle with vocabulary knowledge, categorizing words, inferring meanings of unknown words from context, and monitoring their own understanding. 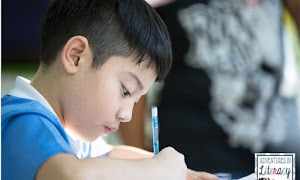 Additionally, they have difficulty connecting their prior knowledge with the text and reading between the lines. 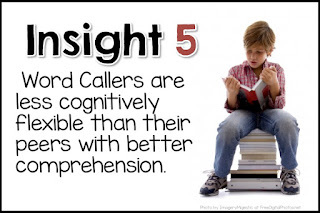 While word callers have a difficult time with meaning, they have many strengths to draw upon such as cognitive ability, text memory, word reading speed, and an ability to decode text. They seem to have "tunnel vision" when reading. They focus on word-level features and miss the text's meaning. I think it is important to remember that word callers have many strengths that we can build upon. The key will be finding ways to help students "multi-task" as they read. 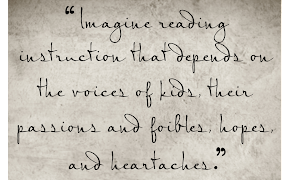 The upcoming chapters will explore ways to help children break away from print and focus more on meaning. Is there a practice you've tried that seemed to help students improve their comprehension? Why do you think the practice was effective? Recent research on children's thinking has provided five important insights will help us understand the difficulties word callers have with comprehension. Word Callers tend to focus their attention on the letter-sound information so intently that they are unable to think about the meaning of the text. 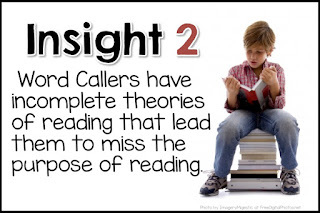 Word callers often think that the purpose of reading is fluency and accuracy. They focus the letters and sounds and not the meaning. 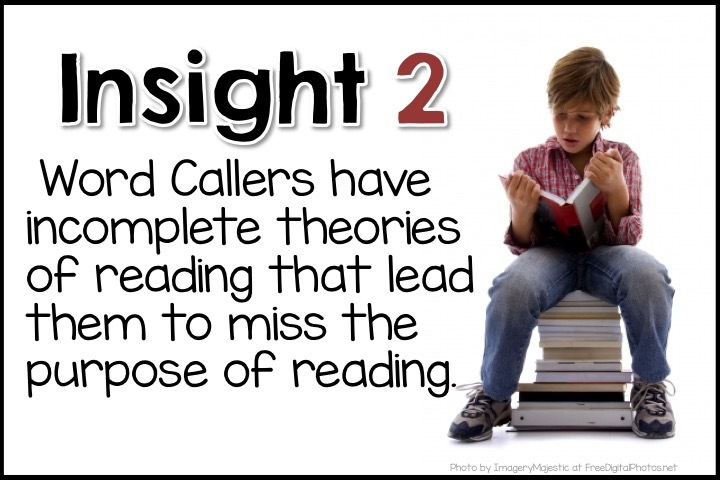 Word callers view the components of reading as separate from one another. Therefore they do not integrate letter-sound information with syntax and meaning. Word callers tend to have difficulty with executive functioning (goal-directed mental activities). Therefore, they focus on decoding rather than getting meaning from the text. 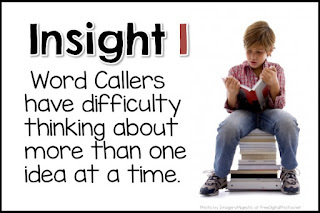 Word callers are less flexible with their thinking. They have difficulty integrating the many components of reading. After reading each of the insights listed above, it's easy to see why word callers struggle to make meaning of text. Reading is a cognitive task. Readers need to develop flexibility in their thinking in order to be successful. 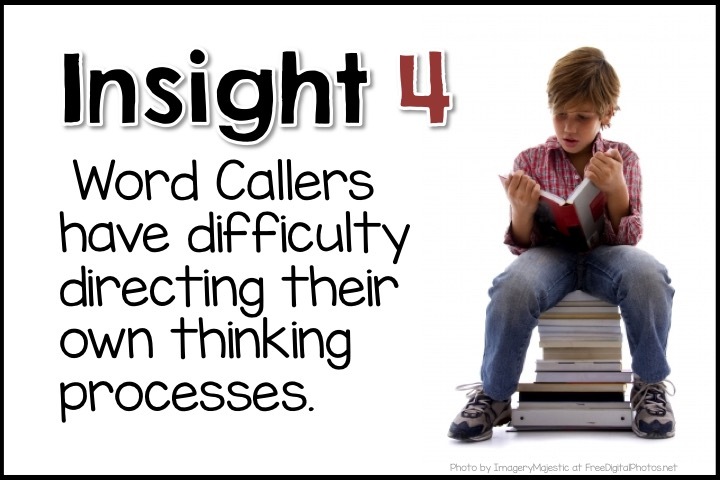 In the chapters to come, Cartwright will share several strategies to help word callers flex their thinking. Have you had observed students who were unable to consider more than one idea or perspective? What practices might help students step outside their own views? 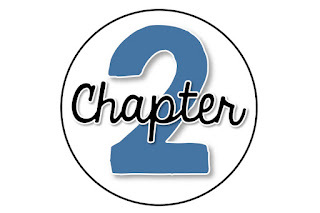 Stop back tomorrow as we continue our book study with Chapter 3 -Who Are Your Inflexible Thinkers?